I have posted here with an interesting silver item. This item is unknown to me. 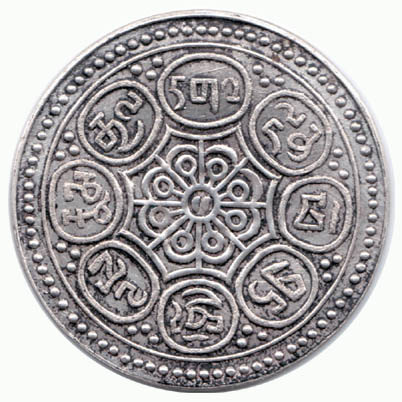 It looks like a common Tibetan tangka coin of 1920s, but it is a machine struck item. I have purchased this item for more than 20 years in flea market of Hong Kong. Recently, when I rearranged my Tibetan collection, I found out this interesting item. If this item is a genuine tangka coin, it should be minted not earlier than 1920's. I have a similar Gaden Tangka [ Rhodes #F viii ] in my collection. But this item has some varieties, it does not have water-line below the lotus flower and the lotus flower appears with three pairs of leaves. 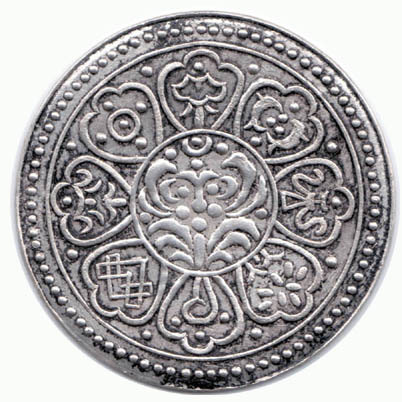 Its lucky signs on the obverse side and the eight petalled flower on the reverse sides are similar to the Gaden Tangka of Rhodes #FVIII. Do you know anything about this item? Do you think this is a fantasy Tibetan tangka? This is a common Gaden Tangka [ Rhodes #F viii ]. 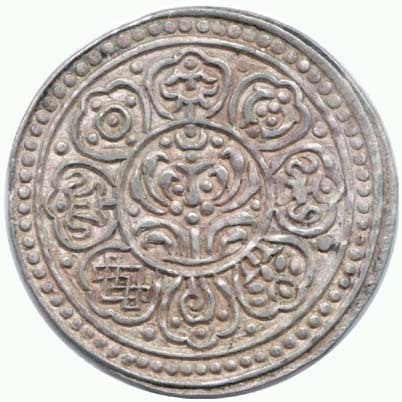 On the obverse side, there is a stylised lotus design within circle surrounded by the eight Buddhist lucky symbols in radiating petals. On the reverse side are the eight petalled flowere within star surrounded by inscription broken up into eight oval frames. Inscription in Tibetan reading "Ga-den Pho-dang Chhog-le rnam-gyal", it means The Gaden Palace victorious on all sides. This tangka in the style of Rhodes type F viii is machine struck and perfectly centred, a beautiful, probably rare forgery. Obverse: there is no water line below the lotus and the lower part of the lotus has six leaves instead of only four. Reverse: The following letters are unusual or incorrect: The lower part of the letters "da" and "na" in the syllables "dga" (north position) and "ldan" (north-east) are curved to the left instead of going straight down. The letter "nga" in the syllable "brang" (south-east) is written like the letter "ta" in Tibetan dbu can script. The coin is below the normal weight range for this type. The unusual features of some of the letters on reverse stands against the possibility of considering that this coin may be a pattern. 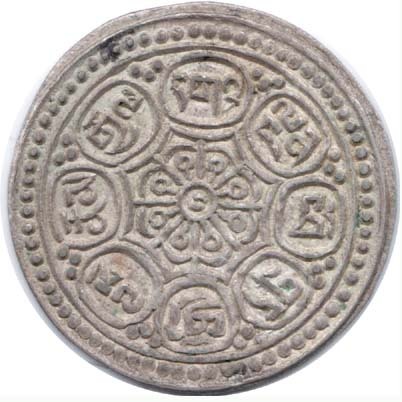 The mystery surrounding this coin is: Why did forgers care to produce such a beautiful copy of a relatively common Tibetan silver coin? .